Brodie, N., Doole, J. and Watson, P. (2000), Stealing History: the Illicit Trade in Cultural Material (Cambridge: McDonald Institute). This report reveals the illicit exploitation of the world’s cultural resources – a destructive and often criminal enterprise. Modern day looting is greater in scale than any carried out in the past, with results that are usually beyond repair. The damage caused to the heritage of humanity and to the history and traditions of living communities is appalling. Action is needed now to stop this plunder. The report is concerned with items that are being illicitly removed from their original contexts. The focus is on archaeological material, but examples are included from areas as diverse as palaeontology, architectural sculpture and the material heritage of communities throughout the world. The report does not attempt to discuss the illicit trade in fine art, nor the related issue of the repatriation of items that have been in museum collections for decades, nor Nazi war loot, nor indeed current cases of theft from museum and private collections. The trade in stolen fine art is also now of such a scale, and is so enmeshed with other criminal activities such as money laundering, that like the trade in cultural material, its full investigation would require a separate report. This report starts with a description of the illicit trade in cultural material, its organisation, the destruction it causes and the role of the art trade in the UK. Legal deterrents and loopholes and the roles of government are discussed next. Finally, consideration is given to what measures might be taken by museums to protect themselves from unwitting participation in the trade and what role they might play in impeding it. 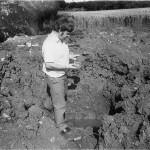 The Romano-British temple site at Wanborough in Surrey, England, was largely unknown and unstudied prior to a remarkable turn of events in the 1980s. 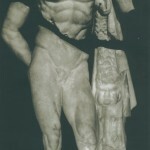 A Roman sculpture: the bottom half was archaeologically excavated at the Turkish site of Perge and the top half was looted and eventually placed on display at the Museum of Fine Arts, Boston, USA.